Fraser Island is one of the great must see destinations in Australia and the Sunset Safaris Fraser Island Eco Tour is the best trip to get you there! Spend your night at Eurong Beach Resort on Fraser Island - just steps from the beach! Have the ultimate Fraser Island experience and let us take care of all the details - all you need to do is sit back and relax! The 2 Day Sunset Safaris Fraser Island Adventure Eco Tour is designed to suit anyone of any age. 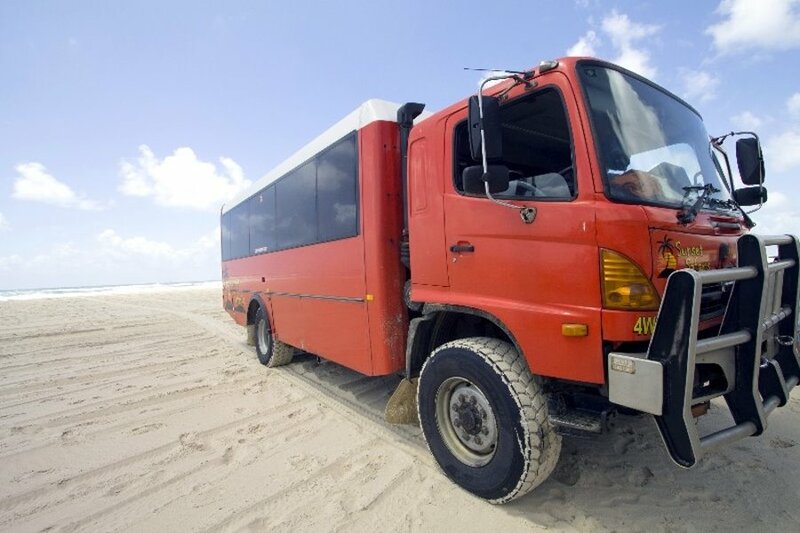 Australian Sunset Safaris have become famous on Fraser Island for their love for fun and knowledge, making Sunset Safaris a number one choice for touring the world's largest sand island. Their mission is to make your visit to Fraser Island more than just a beautiful place to go, but also an experience to remember! Stop at Maheno Shipwreck, The Pinnacles, Yidney Dripping Rocks and more! Lake Birrabeen - Escape the crowds and swim in this clear lake! Central Station - Gaze up at Fraser's oldest trees! 75 Mile Beach - Drive on Fraser Island's sand highway! Depart Surfers Paradise at 5:45am, Brisbane 7:15 am, Pick-up Noosa 9:15am and Rainbow Beach at 10:30am. Free Cooloola National Park Tour seeing Kangaroos, Red Canyon, Teewah Beach & Rainbow Beach (tide and weather permitting). Once on Fraser Island, you will visit 75 Mile Beach, Eurong Beach, Yidney Dripping Rocks, Eli Creek, Maheno Shipwreck, Coloured Sands and Indian Head where you can look out for dolphins, turtles, sharks and whales! During your first day, lunch may be provided at one of a number of locations, and can be swapped with day two to suit conditions. You will spend your night at Eurong Resort, where you will enjoy a restaurant dinner and some downtime to relax, beachwalk or join in on the fun at the Beach Bar. Rise bright and early and depart Eurong Resort by 8am. From here venture to Pile Valley Walk, Central Station, Wanggoolba Creek, Lake Birrabeen, Scenic Lakes Drive and 75 Mile Beach to finish up your tour on Fraser Island! On day two you have to purchase your own lunch at Rainbow Beach after departing the island. Arrive in Rainbow Beach around 1:00pm, Noosa at 3:30pm, 4:45 at the Big Pineapple, 6:30pm Brisbane and 7:30pm to the Gold Coast. *Return time are an approximation. Customers can be dropped off at another location. For example, you can be picked up in Brisbane but dropped off at Noosa. **Please note pick-up/return times, and sites visited are dependent on time constraints, weather and tidal conditions. All client cancellations forfeit 25% of total ticket price and all client cancellations made less than 21 days prior to departure will result in complete forfeiture of the full price of the tour or package. If the tour operator has to cancel the trip or activity (prior to the departure) and we cannot offer a suitable alternative, then a refund will be given minus card fees. We strongly recommend that you have travel insurance. "My sister and I had an amazing 2 days on Fraser Island with a group of international tourists. Our travel guide was entertaining knowledgeable informative passionate about all this impressive Island has to offer. His driving skills were outstanding. We all felt safe as he easily manoeuvred some challenging areas on the sand and driving tracks. Thanks to Rhett our travel expert who made this trip so enjoyable. A must to do for all tourists and we Aussies. Hopefully you will be lucky enough to get Rhett as your guide!!!"